It would be such a shame not to let the Bride walk up the aisle! That seemed to be the message from Bishop Graham Kings last weekend, in a speech to support the Anglican Covenant. Even if she isn't sure she wants to go through with it, it would be tragic to stop the wedding plans - the Archbishop has bought her a beautiful dress and the flowers will be lovely! Talking of the Covenant in terms reminiscent of the Marriage service in the Book of Common Prayer, he points out that the parents of the bride have worked so hard to put it all together, and their hard work, "should not be dismissed today ‘unadvisedly, lightly or wantonly’"
Instead, this arranged marriage between the members of the Anglican Communion "should be accepted ‘reverently, discreetly, advisedly, soberly and in the fear of God’." This surprising concept of marriage in the 21st Century seems to take little notice of the wishes of the partners who are to be married - after all, what do they know? No need for a shotgun here though - not when the 'fear of God' is involved. The problem is, of course, that the prospective marriage partners are getting decidedly twitchy feet. Out of the 15 Dioceses in the CofE who have now voted on the Anglican Covenant, 10 of them have voted 'No', including Bishop Kings' diocese of Salisbury. 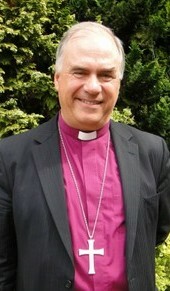 Even so, the Bishop pleaded, "It is vitally important that the Covenant is discussed at General Synod in July. If less than half of the Dioceses vote for the Anglican Communion Covenant, it will not be allowed to be discussed at General Synod. That would be tragic." Readers of this blog will remember of course, that General Synod has already discussed the Covenant. Many people spoke against it including one Bishop who said it would lead to 'factory farmed religion rather than free range faith'. Synod members who were inclined to vote against it were told that it would be wrong to do that because, after all they were only voting to pass it on to dioceses for consideration. Now however, as the Ecclesiastical Dominos have failed to fall in line, the message appears to have changed. Now it would be a great shame for dioceses do not return it to General Synod for discussion, according to Bishop Kings - even though they don't want it. So when is the right time to pull out of a wedding? Is it better to wait for the wedding day? For the wedding service perhaps? Indeed, for the moment of the vows? Afterall, the planning, the arrangements, the detail which has gone into putting together a wedding of this size, is so much more important than the marriage which follows. Or is Bishop Kings hoping that if the bride gets all the way to the altar, she won't have the courage to duck out of the final vows in front of her assembled family and friends? Either way, you would think that a bishop would know that unless the partners are genuinely committed, it really is better to think twice. And all the evidence from the CofE points to ambivalent mistrust rather than committed love. The real problem with the marriage metaphore, however, is that the Anglican Communion is more like an existing family of brothers and sisters, rather than a loving couple in the flush of first love. And the Prayer Book specifically forbids marriage between siblings because of the bad blood it breeds. So surely it would be better to stop the wedding before things get really out of hand. Well done. Thank you for this sparkling gem of sanity in a sea of madness. Love this but hard to read white on black. I think the label of "abomination" pretty much sums up the Covenant. Why are these bishops so eager to continue to discuss what has already been discussed to death? For once, the i sufferably long decision making process in the CoE has worked against the grindstone, because the longer this Covenant lies around the more the stink of it magnifies. I appreciate your comments and hope that this Covenant is not adopted because it will do more to wreck the Communion than anything the Episcopal Church and the Candadians could invent. Well said. As a non- C of E person, let me add some wisdom from an American poet, Carl Sandburg, "Take a good look at the mother before marrying the daughter." The divisions in the C of E itself do not bode well for greater unity among the siblings. The prayer attributed to Jesus, "That they all may be one." appears only in John, the least historical of the Gospels. I think it likely the author was reacting to the already apparent schisms in the late first century (or perhaps early second century) church. Schism is old, bitter vintage and the communion seems destined by really bad leadership, to drink it again. Be it "Forward in Faith" which never even leans forward, or those Americans who insist on "alternate jurisdictions" a code phrase for a church were their clerics can fulfill their ambitions, the march seems inevitable. This Covenant won't help.